Located near one of the most exclusive towns in Costa Smeralda, Hotel Le Ginestre is the perfect choice for couples. If you are looking for the best beaches in Sardinia with crystal clear water lapping expanses of fine white sand and bustling seaside towns, the Costa Smeralda should be considered your first choice. Hotel Le Ginestre is situated just minutes away from Porto Cervo, and yet offers a peaceful setting amongst luxuriant gardens combined with fine views towards the Gulf of Pevero. Delightfully decorated throughout, the hotel offers newly refurbished and well-appointed bedrooms, with the emphasis on guest comfort. The hotel has its own private beach, a fresh water swimming pool and a cocktail bar. For the more active guests, there is a choice of water sports and other activities to try on-site. 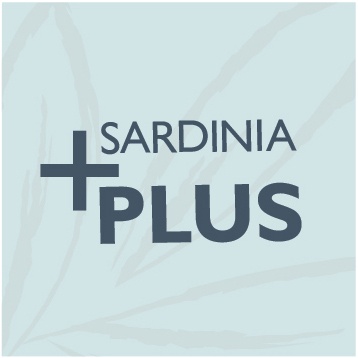 In the evening, the restaurant offers a good selection of typical Sardinian dishes for you to sample as well as international cuisine. Swimming pool, restaurant, cocktail bar, fitness and beauty centre, Wi-Fi, beach with sunloungers, umbrellas and towels (300m away), tennis, water sports. En-suite bathroom, satellite LCD television, telephone, minibar, air-conditioning. 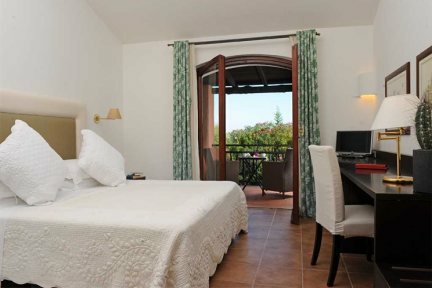 Classic rooms (16m2) are nautical style double rooms with a terrace and view on the garden. 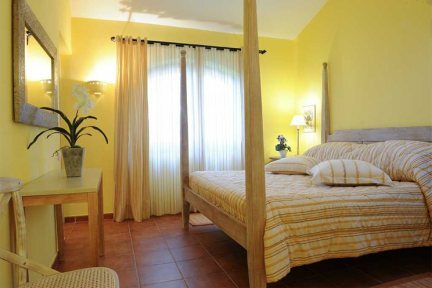 With a double or twin beds, en-suite room with shower or bath. 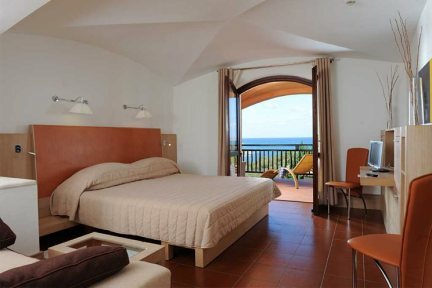 Superior rooms (16sqm) rooms have a terrace and view on the sea and the garden or the sea and the freshwater pool. With a double or twin beds, en-suite room with shower or bath, and tea making facilities. Junior suites provide charming views of the sea from a large private terrace furnished with a teatable, two comfortable chairs and a sun lounger. The room is bright and comfortable with a king size double bed and a sofa. The bathrooms are decorated with Sardinian marble tiles. The Suites include a large bedroom and a lounge, terraces with a seaview, teatable armchairs and sun loungers. Magnificient bathroom with shower, bathtub or both. Porto Cervo is somewhat the heart of the Costa Smeralda. An up-market centre of indulgence, it is located around two yacht harbours on the north side of this dazzling stretch of coastline, and being the main resort of the area and a paradise for the jet-set, it’s definitely worth a visit. Set in the heart of the resort and lined with cafés, bars and restaurants, the "Piazzetta" is the perfect spot to lounge in style - it is the place to see and be seen. An evening stroll along the quay is also a must, with designer boutiques on one side, and luxury yachts lining the marina on the other. The posh boutiques selling fashionable designer goods such as Gucci, Versace, Prada & Hogan continue the trail throughout the pastel coloured maze of grotto-like shopping arcades within the resort. Italian architect Michele Busiri Vici designed this grotto-like creation and has a strong presence within Porto Cervo, having also designed the Stella Maris church. Elevated and situated in a craggy edge of the land, to the west of the centre, the church is something of an art deco landmark that overlooks the comings and goings of the town.